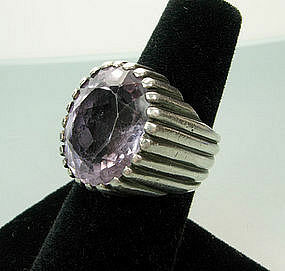 Chunky heavy early modernist ring with a large faceted genuine amethyst stone. With two tiny marks on the outside of the shank. One is 800 or 900 (I can't be sure which), for silver content, and the other is a tiny hallmark or maker's mark in a cartouche. Circa 1940. Most likely European, based on the silver content and the other mark. Very well worked, with deep parallel ridges, in a great Deco/modernist design. Heavy for its size at 20 grams. Ring size 6. The top is just over 3/4 inch by just over 1/2 inch. Excellent condition. The facets of the stone have some slight wear, only visible with a loupe. Photos enlarged to show detail.